Are you ready for a decor update in your Springs luxury apartment home, but your budget has different ideas? You don't need a fat bank account to give your home a fresh new facelift. Here are some great items with a mini price tag but maximum style. Artwork is often considered to be an expensive acquisition, but you may be surprised at the creative pieces you can find for $25 or less. Etsy and Wayfair are two good places to shop online. If you want some quirky art with your own personal touch, flea market finds can be transformed into some unique wall hangings. Not only are vases decorative on their own, but you can give them different looks by displaying flowers based on seasons, home decor colors or any theme you like. 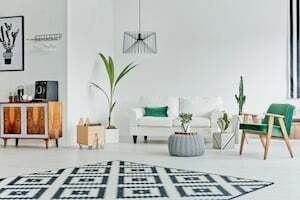 Planters have come a long way since the generic terra cotta versions, and you can find them in a wide range of sizes to suit any spot in your apartment. There may be no easier way to add a pop of color than with throw pillows and blankets. These items are inexpensive and easy to store, and blankets are available in lightweight and all-season fabrics so you can get the look year-round. Floors are often overlooked as a prime area for decoration, but the hardwood-style floors in our Springs luxury apartment homes are a perfect setting for some fabulous area rugs. They come in an unlimited variety of shapes, colors and patterns to fit any decor style. Lighting is another decor element that's rarely considered, but a $15 lampshade can completely transform the look of a lamp. Baskets are the multi-taskers of home decor, serving as both style and storage. World Market and Pier One are two of the top sources for baskets of all types. Want to add some "space" as well as style? Wall mirrors are a classic way to make a room appear larger and brighter. At one time candles were primarily on hand for emergencies, but today they're a convenient and inexpensive decoration. As a bonus, many of them also act as air fresheners. Worried about safety? Battery-powered LED candles require no flame. A clock may sound more practical than decorative, but many wall clocks are like pieces of art, from whimsical to retro to modern. Picture frames are versatile items that can stand alone or hang on a wall. Use them to display photos, posters and other types of ready-made art, or create your own with wallpaper, die-cuts and various DIY materials. Even with nothing inside, picture frames have great visual appeal. Have you scored a great home decor item for $25 or less? Tell us about it in the comments!